It was hard to put down Homer's Odyssey by Gwen Cooper. 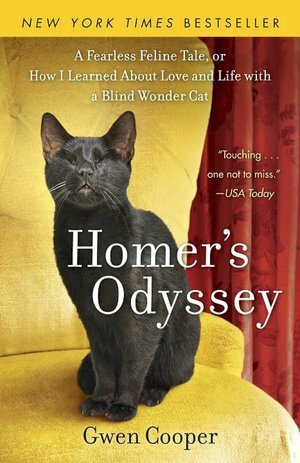 Homer truly is a blind wonder cat. This was such a sweet story on a kitten that was blinded from an infection in the eyes, the infection left no other option then to have the eyes removed. And nobody seemed to want him. He is a cat that wouldn't let anything stop him from trying to do and be like any other normal cat. Gwen has already had two other cats, and didn't want a third, but she was Homer's last chance and she took it. The story follows Gwen and Homer through eleven years of life together and of Gwen's other two cats as well. Some parts actually seemed like my story a little bit. Gwen, right after college had to move back in with her parents to gain stable financial footing with her brood. I'm in the same spot in life and seeing how she did it and made it through, was very inspiring and encouraging to see that there is a light at the end of the tunnel, even if it take a little time to get there. Through everything Gwen dealt with, Homer stayed constant. He was fearless and he knew no limits. He really is an amazing cat with a fun personality. It's easy to see why everyone who met him, fell instantly in love with him. Cat people and (only) dog people alike. I say that this is a to read! If you love animals, cats or dogs, you will enjoy it.